Stunning Hollywood Hills Home...Celebrity Area, GREAT VIEWS AND REVIEWS! Beautifully Furnished & Elegant Hardwood Floors... Large Screen, HD Flat Panel TVs... TIVO, HBO, MLB, NHL & NFL Games are all FREE... FREE Wireless Internet for Entire House... Three Bedrooms, Kitchen with Breakfast Nook, Dining Room, Living Room, Business Office downstairs & Fitness Room in Garage... Sleeps up to Eight (details below)... Huge, Terraced Yard has Tons of Fruit Trees, Patio, Grill & Relaxing Hammock... Stainless Steel Appliances... Pet Friendly - Inquire!... Perfect for Family Vacations, Business Travelers and Entertainment Executives. Gorgeous, Terraced Backyard has Tons of Fruit Trees - Oranges, Lemons, Apricots, Avocados, Grapefruits, etc... Tenants can Help Themselves with all the Fresh Fruit... Two, Outdoor Patios are Great for Entertaining: Downstairs Patio has a Gas Bar-B-Q Grill with Beautiful Patio Furniture... Upstairs Patio has a variety of Relaxing Chairs, a Lounge Chair, an Ice-Cooler for Drinks, and a Breathtaking View.... Top Tier has a Peaceful, Wooded area with Large Trees and a Comfortable Hammock for Rest and Relaxation. Ann is a hard working mom who was born in New York and lives in LA, near this gorgeous home. Home is located in one of the best kept secret neighborhoods of Los Angeles, a hilly enclave filled with celebrity homes located close to everything. Top of the line appliances and amenities throughout. Views of the Hollywood Hills from the upstairs patio are incredible. Tenants will especially enjoy the backyard which is a tropical oasis with fruit trees and two patios for eating and entertaining. Bathroom upstairs has tub/shower enclosed in tiled glass. Bathroom downstairs has shower and private bath for 3rd bedroom. Fantastic views of the Hollywood Hills, Near the Famous Hollywood Sign! Garage transformed into a Fitness Room with Elliptical Machine, Weight Machine, Stationary Bike and More. Living room has Large Screen HD-TV, Blue Ray-DVD, Video Apps Available on Blue Ray, Surround Sound, Receiver, Playstation 2, Video Games, etc. Fully equipped Kitchen also has Breakfast Nook, table + chairs. Direc-TV comes in HD, with FREE TIVO-DVR Recorder in Upstairs Bedrooms and Living Room. Plus, FREE HBO, NFL games, MLB games, NHL games. Watch all your Favorite Local Teams and Don't Miss a Game! Living Room has Surround Sound and Stereo. DVD player in Master Bedroom. Living Room and 2nd Bedroom has combo Blu-Ray and DVD. Downstairs Patio Covered for Shade and Rain Protection. Two Patios. Upstairs Patio has lounge chairs and Fantastic Mountain Views. Downstairs Patio has Outdoor Table, Chairs and Grill for Entertaining. Direc-TV with HD in Every Bedroom and Office... Garage Gym has TV, Elliptical Machine, Weight Machine, Sit-up/Crunch Machine, etc... 55" Flat-Screen HD-TV in Living Room, Surround Sound Speakers, Stereo, Blu-Ray-DVD Player, Playstation-2 with Games.. Master Bedroom has 50" Flat-Screen HD-TV; TIVO, DVD player.... 2nd Bedroom has 32" Flat-Screen HD TV, TIVO, Blue Ray-DVD Player... Copper Pipes and Great Water Pressure... U-V Light, Allergy-Free Central Heating and Air... Beautifully Furnished, Leather Couch in LR and High-quality Beds... New Stainless Steel Appliances, including Ice-cube Maker in Refrigerator... Entire Home has FREE Wireless Internet.... 3rd Bedroom also a Business Office; equipped with Desk, High-Speed Internet and Printer... Washer/Dryer Laundry Area in Yard... Bring your Dog! 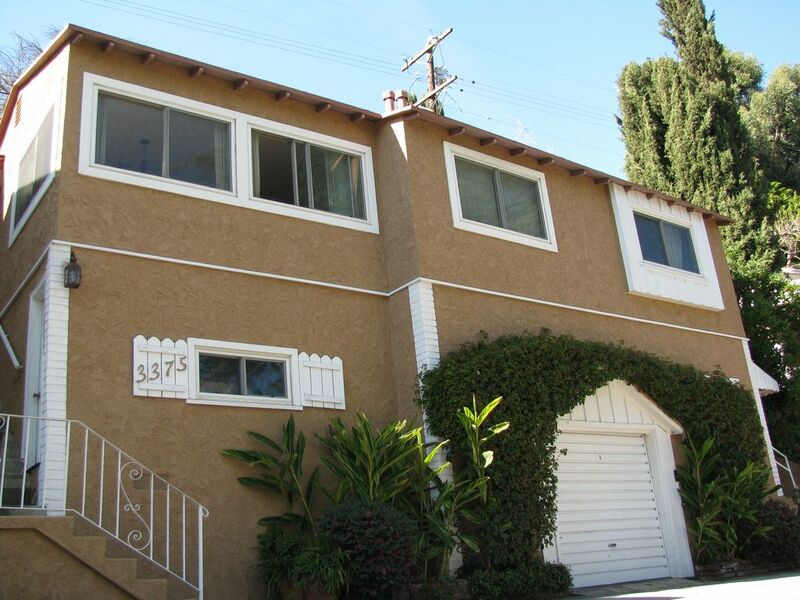 Pet-friendly, Fenced-in yard... Gorgeous, Terraced Backyard has a Beautiful, Mountain View... Tons of Fruit Trees... Two, Outdoor Patios Great for Entertaining!! This house is comfy, cute and very close to Universal Studios. With two families staying together this house fit us much better than two hotel rooms would have. We were able to have breakfast and coffee at the house before we went to the park each day and sit around chatting easily. The beds were comfortable and the house was clean. Our only issue was that we couldn't figure out how to turn on any of the TVs, but that was fine because we were at Universal Studios every day and usually exhausted by the time we got home at night. The wi-fi worked so we all had our phones and tablets we could play with, so we didn't miss the TV. This house is fantastic! We came from a tiring 4 days of disneyland and this is just what we needed to land up in. So comfortable and relaxing. Rooms are spacious and clean. Beds are comfy. Location is KEY to this property. So close to everything you want to see in LA. The top patio with the view of the hills is stunning. Go up there with your coffee in the morning and smell the flowers (literally) and listen to all the birds chirping about. I can't say enough about what a gem this property is. I wouldn't hesitate to book this again and again. Thanks for pointing out the stunning views and relaxation area on the top deck. Come again! Great and honest headline - "Beautiful and Peaceful" - both words describe this home accurately. Thanks for the review. Great spot in the Hollywood Hills! Super clean and convenient place--just a couple minute Uber ride to Universal Studios and a nice amount of space for the three couples we had staying there. Thanks to the owners! Location was amazing. House was a little smaller then expected. Backyard needs a little updating but overall was satisfied. • Fees: * $59 for property damage insurance protects you up to $1,500 in case something breaks. * $95 cleaning fee. * $95 pet fee, per pet, if dog is allowed. * 14% hotel tax for any stays in Los Angeles less than 30 days. Tax is legally waived if you stay 30+ days. * Military & Multiple Week Discounts - Inquire! * All Utilities, High Speed Internet, Direc-TV, TIVO, HBO, and NFL, MLB and NHL Games are all FREE!